Chicago restaurant group Hogsalt collaborated with MGM Resorts International and New York-based Sydell Group to open Bavette’s Steakhouse & Bar, a Vegas version of the popular Bavette’s Bar & Boeuf in Chicago. It’s part of the rebranding of the Monte Carlo as Park MGM and NoMad Hotel. Décor mirrors the Gilded Age, with glowing chandeliers and opulent wood and leather comforts of the chophouses of the past. On offer is classic American steakhouse fare rooted in French cooking and cooking techniques, with a menu that includes seafood towers, bone-in dry-aged rib-eye, prime rib and a burger inspired by Hogsalt’s Chicago brasserie Au Cheval. There is also a curated cocktail and wine program that nods to the history of steakhouses and embraces Bavette’s 1920s speakeasy vibe. Bavette’s Steakhouse & Bar, 3770 Las Vegas Blvd. S., Las Vegas, NV 89109, 702-730-6700. Wolfgang Puck’s Spago is recognized by many for igniting Las Vegas’s dining scene when it debuted at Caesars Palace in 1992. Now it has been announced it will close on January 27 and will be relocating across the street to the Bellagio, opening in summer 2018, replacing Todd English’s Olives, which closed January 13. The new venue will feature an open-air patio, brass fixtures, smoked-oak wood floors, modern art pieces, a neon light fixture and floor-to-ceiling glass windows providing views of the iconic Fountains of Bellagio. The globally-influenced seasonal fare will include Puck’s signature touches, such as gourmet pizzas topped with salmon and caviar, a multi-course California tasting menu, special bar menu of Wolfgang Puck favorites, an artisanal cocktail program and extensive international wine list. Spago, Caesars Palace, Forum Shops at Caesars, 3500 Las Vegas Blvd. S., Las Vegas, NV 89109, 702-369-6300. SLS Las Vegas will celebrate Labor Day weekend with poolside cookouts at its Foxtail Pool from 11 a.m. to 4 p.m. Friday, Sept. 1 to Monday, Sept. 4. The grill will be fired up and a special of baby-back ribs or classic barbecue chicken with a side of home-style coleslaw, corn on the cob or cornbread will be available for $15. In addition, beer buckets of Bud Light, Michelob Ultra, Budweiser or Bud Light Lime will be priced at $35. The resort-style pool will also host a live DJ from noon to 6 p.m. all weekend long. SLS Las Vegas, 2535 S. Las Vegas Blvd., Las Vegas, NV 89109, 855-761-7757. After undergoing a significant renovation, Sonoma Cellar at Sunset Station Hotel & Casino has reopened with an updated décor and menu. Evoking a wine cellar, the original design endures with arched stone walls throughout. Additions include large decorative mirrors, a color scheme of light gray and white with cream colored chairs and emerald colored booths, and a bar space that has doubled in size. New menu items are a crab cocktail with white rémoulade; Penn Cove mussels; steak tartare; bone marrow; and smoked pork belly made with a Southern grits mousse, bourbon maple and rainbow chard. The steakhouse is now sourcing some of its meats through Niman Ranch, and all meat is aged in-house. A special bar menu is available, with Cajun touches from Louisiana-born chef Britt Beeland, such as fried green tomatoes, Buffalo frogs legs and crab dip. Sonoma Cellar, Sunset Station Hotel & Casino, 1301 W. Sunset Rd., Henderson, NV 89014, 702-547-7898. Twin Creeks Steakhouse at Silverton Casino Hotel is offering Filet Fridays every Friday in September. Priced at $50 per person, the special includes a house salad, six-ounce filet mignon, baked potato, dessert and a glass of wine. The special is available during dinner service from 5 p.m.-10 p.m. Twin Creeks Steakhouse, Silverton Casino Hotel, 3333 Blue Diamond Rd., Las Vegas, NV 89139, 702-914-8594, 866-946-4373. 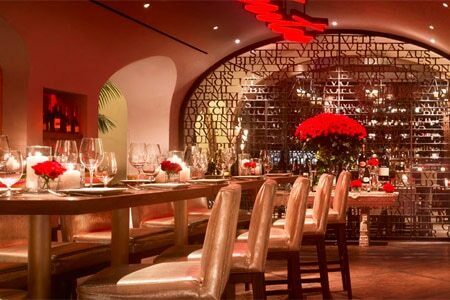 La Cave Wine & Food Hideaway at Wynn Las Vegas is offering bottomless cocktails from 11:30 a.m.-3 p.m. Monday through Saturday. Priced at $28 per person, the bottomless selections include mimosas; red or white sangría prepared with peach schnapps, triple sec, brandy, oranges, raspberries and Asian pears; Bloody Marys made with Tito’s vodka, Demitri’s Bloody Mary Mix and celery salt; Painkillers blended with Sailor Jerry rum, Coco Lopez purée, orange and pineapple juice; and margaritas crafted with Patrón tequila. La Cave also serves bottomless cocktails ($28 per person) during its butler-style brunch on Sundays from 10:30 a.m.-2:30 p.m. La Cave Wine & Food Hideaway, Wynn Las Vegas, 3131 Las Vegas Blvd. S., Las Vegas, NV 89109, 702-770-7375. While Vegas buffets are rarely, if ever, thought of as being an option that is attractive to health-conscious diners, that may be about to change. Red Rock Casino, Resort & Spa has introduced a Well & Being station at its Feast Buffet featuring health-conscious fare presented in balanced portion sizes. Expect vegan, paleo, low-carb, high-protein, raw foods, gluten-free and super foods options with ingredients in all of the dishes focusing on anti-inflammatory foods that are pH balanced and rich in antioxidants and omega 3. Look for sweet potato quesadillas, soba noodle salad, roasted veggie sliders, cauliflower with tomato basil and curry chickpea spinach. Feast Buffet, Red Rock Casino, Resort & Spa, 11011 W. Charleston Blvd., Las Vegas, NV 89135, 702-797-7777. Mediterranean-inspired Cleo at SLS Las Vegas is offering a five-course dining experience, priced at $35 per person. Courses include a choice of hummus with tahini or lebaneh with feta, both served with warm laffa bread; Greek or beets salad; spicy cigars (fried phyllo rolls filled with meat and spices) or Brussels sprouts; grilled hanger steak or garlic shrimp; and sticky toffee pudding with vanilla gelato or flourless chocolate cake with vanilla gelato. Reservations are available by calling 702-761-7757 or via OpenTable. Cleo, SLS Las Vegas, 2535 S. Las Vegas Blvd., Las Vegas, NV 89109, 855-761-7757. Smith & Wollensky has shuttered. The steakhouse will open a new location in Las Vegas. Smith & Wollensky, 3767 Las Vegas Blvd. S., Las Vegas, NV 89109, no phone. Parent company B&B Hospitality Group has announced that Mario Batali and Joe Bastianich’s B&B Burger & Beer at The Venetian will be closing after service on September 30, 2017. The closure is in anticipation of the opening of Eataly taking place in late 2018 as the Monte Carlo transitions into the Park MGM. B&B Burger & Beer opened in 2013 and was the group’s fourth Las Vegas restaurant. 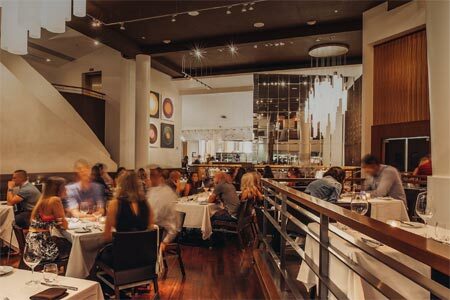 The Group’s three other Vegas restaurants – Carnevino, Otto Enoteca Pizzeria and B&B Ristorante – will remain open. B&B Burger & Beer, The Venetian, 3355 Las Vegas Blvd. S., Las Vegas, NV 89109, 702-414-2220. Bistro Buffet at Palms Casino Resort has closed and will be transformed into a new food hall. Bistro Buffet, Palms Casino Resort, 4321 W. Flamingo Rd., Las Vegas, NV 89103, no phone.